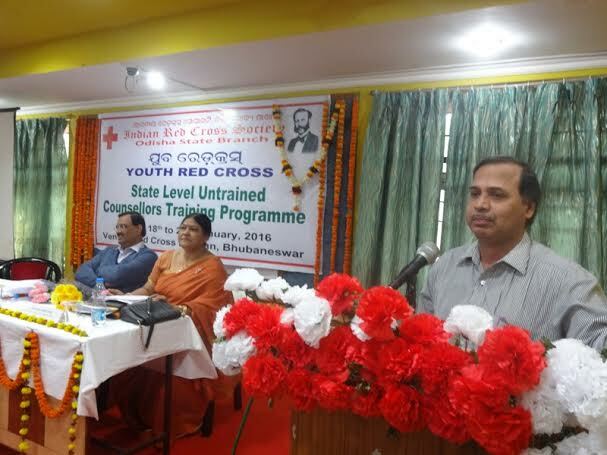 Indian Red Cross Society-Odisha State Branch(IRCS-OSB) Youth Red Cross has organised a 03(three) days State level training programme for untrained Youth Red Cross Counsellors from 18.01.2016 to 20.01.2016. The objective of this three days programme is to acquaint the Counsellors with various activities and objectives of Youth Red Cross with the view to strengthen YRC movement in Odisha. Dr. Nihar Ranjan Pattnaik, Director, Higher Education graced the inaugural session as the Chief Guest. He inspired the Counsellors to have commitment for humanitarian service and to organise various YRC Programmes at the college level. Dr. Chakradhar Panda, Secretary, Youth Red Cross, Odisha extended a warm welcome to all the guests & participants. He highlighted on the vital role played by YRC Counsellors on grooming the Youth volunteers to act as change agents for the betterment of the society and contribute to the Red Cross movement. The programme was coordinated and vote of thanks offered by Dr. Maj. Kalpana Das, Youth Red Cross Officer and assisted by Sri Lingaraj Panda.